Brooklyn Rider — Laguna Beach Live! The genre defying string quartet Brooklyn Rider deftly employs creative programming and exciting collaborations to illuminate music in fresh ways and invite their audiences into a shared experience. Uniquely capable of addressing a wide and inclusive range of music, they are as willing to explore the world of Haydn and Debussy as they are in the music of our time. They have performed in venues as varied as Joe’s Pub in NYC, the Todai-ji Temple in Nara, Japan, and the San Francisco Jazz Festival. Born out of a desire to use the rich medium of the string quartet as a vehicle for communication across a large cross section of history and geography, Brooklyn Rider is equally devoted to the interpretation of existing quartet literature and to the creation of new works. They have worked with numerous composers such as Derek Bermel, Lisa Bielawa, Ljova, Philip Glass, Osvaldo Golijov, Jenny Scheinman, Dimitry Yanov-Yanovsky, and a frequent part of Brooklyn Rider’s programming also involves works written or arranged by members of the group. Exploring new creative possibilities through collaborative programs is also an integral part of their work. Some recent special guests include Chinese pipa virtuoso Wu Man, Syrian/Armenian visual artist Kevork Mourad, traditional and technology-based Japanese shakuhachi player Kojiro Umezaki, Irish fiddle player Martin Hayes, and singer/songwriter Christina Courtin, whose widely released debut album on the Nonesuch label features several tracks with the quartet. A long-standing relationship between Brooklyn Rider and Persian kamancheh virtuoso Kayhan Kalhor resulted in the critically acclaimed 2008 recording, Silent City, on the World Village/Harmonia Mundi label. Bringing music to new audience and venues is an essential part of the quartet’s creative mission. Brooklyn Rider often appears under the umbrella of outside initiatives begun by all four members of the group. In 2003 violinist Johnny Gandelsman created In A Circle, a series of performance events in Lower Manhattan and Brooklyn that explore connections between music and the visual arts. In A Circle Records was created by Johnny in 2008 with the release of Brooklyn Rider’s eclectic debut recording entitled Passport. Brothers Colin and Eric Jacobsen are co-founders of The Knights, a chamber orchestra based in New York that recently opened the 2009 Dresden Musikfestspiele and released two albums with Sony Classical. The quartet also founded the Stillwater Music Festival (MN) in 2006 as a place where they unveil new repertoire and unusual collaborations. As educators, the quartet has been in residency at Williams College, MacPhail Center for the Arts, Dartmouth College, Texas A&M University, and Denison University. The dynamic musical profile of Brooklyn Rider has been featured on WNYC’s Soundcheck and Minnesota Public Radio’s, Performance Today, and their recordings have been played across North America on radio programs that range in focus from classical to world to jazz to pop to new music. Much of Brooklyn Rider’s desire to extend the borders of conventional string quartet programming has been through their longstanding participation in Yo-Yo Ma’s Silk Road Ensemble. As individual members of the ensemble, they have performed throughout the world, recorded three albums for Sony Classical, and have reached audiences through a series of educational initiatives, family concerts and media broadcasts. Members of Brooklyn Rider have taken part in a series of museum residencies initiated by the Silk Road Project that have taken them to the Rubin Museum of Himalayan Art and the American Museum of Natural History in New York City, the Art Institute of Chicago, the Museum Reitberg in Zurich, and the Nara National Museum in Japan. They have also participated extensively in ongoing Silk Road Ensemble residencies at Harvard University and the Rhode Island School of Design. The quartet’s name is inspired in part by the cross disciplinary vision of Der Blau Reiter (The Blue Rider); a pre World War I Munich-based artistic collective comprised of Vassily Kandinsky, Franz Marc, Arnold Schoenberg and Alexander Scriabin, to name a few. 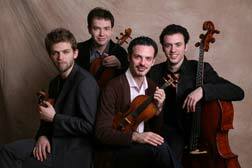 In this spirit, Brooklyn Rider has created an online art gallery showcasing the work of friends of the quartet in which the proceeds are used to support new commission projects (http://www.brooklynrider.com/ ). The quartet also draws inspiration from the exploding array of cultures and artistic energy found in the borough of Brooklyn in New York City, a place they also call home.